As SaaS picks up steam, more resources are coming online to help with the transition to on-demand delivery. 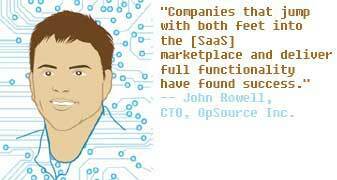 Lots of businesses are starting to examine whether the emerging Software as a Service (SaaS) model will work for them. If you're one of them, consider this: It's working fine for a company that does twice eBay's volume of business. Ariba Inc., based in Sunnyvale, Calif., claims the world's largest supplier network, handling about $93 billion worth of transactions annually. It has annual revenues in the $300 million range and about 1,600 employees. Thus, deciding to rework its flagship solutions for helping corporations manage their corporate spending, a category known as spend management, was not an easy or quick decision. But, once decided, there was no turning back, says Rick Collison, Ariba's director of spend management solutions. Ariba implemented the first wave of its SaaS offerings in November 2005, and has been solution complete on SaaS for about nine months. As with most companies' transition to SaaS, it's been a bumpy road, but worth the wear and tear. "We're walking, not running," Collison asserts. But it's also walking in the right direction both for the company and for its customers. For instance, Pittsburgh, Pa.-based regional grocery store chain Giant Eagle turned to Ariba's SaaS offering to more efficiently manage its supply chain and saved $17 million in the first year. According to Christine Crandell, Ariba's vice president of marketing, efficiency is where customers usually start seeing the savings. "They say, 'Now that I've done that [utilizing SaaS] and seen the savings, I can now move to do other things like visibility' -- and that way, they can see where they're spending their money," she says. The happy fact is that there are probably more resources available for those types of companies. Among the first places to start looking is in Redmond, with Microsoft's Live offerings. The software titan has jumped into the SaaS space, rolling out a number of initiatives aimed at capturing a slice of the burgeoning market, says Marie Huwe, general manager of marketing for the Microsoft Worldwide Partner Group: "Our commitment is to make sure that across our Live offerings, we have a model for each type of partner, so they can take advantage of new properties that enable, for instance, a small company that can't afford a server to take advantage of a CRM offering." Huwe admits, however, that even Microsoft is still trying to find its way in the SaaS world. "We don't have it all figured it out, and we want to make sure we're building the right programs around the Live offerings," she says. "Live itself is a huge move to advertising and subscription-based models." Microsoft's Live offerings aren't complete yet, but Huwe estimates that they will be by late 2007. John Rowell, CTO of OpSource Inc., a Santa Clara, Calif.-based company and Gold Certified Partner that helps other businesses with the switch to SaaS, agrees that Microsoft is wading in cautiously, but he's confident that Redmond will do well. "[Microsoft has] put some of its best and brightest on this. [It has] a lot of tactical challenges to delivering SaaS." But he sees promise in some of Microsoft's nascent efforts. "The Dynamics platform is going to take a run at Salesforce.com. Most people don't think of the Microsoft platform in that way," Rowell says, but adds that the tide may be turning. Huwe believes a major part of that tide is small and midsize organizations. "What's attractive about Live is that there are a lot of medium and small partners that don't want to be service providers, but want to extend their reach. Our message to them is 'get engaged with us now.' If you have a CRM business today, it's very easy for you to add smaller customers with CRM Live, and you can grow your customer [base]." Increasing your customer list without building out additional infrastructure or becoming an IT services company is among the goals of Microsoft's SaaS offering, says Huwe: "If you're a small customer, it's not how you want to grow from $10 million to $100 million [in revenue] per year, but how you maintain current customers and add customers without adding additional infrastructure." Beyond its in-house programs, Microsoft is also building an impressive list of SaaS partners such as OpSource and Andover, Mass.-based NaviSite Inc., which is adding SaaS components that Microsoft doesn't currently handle. NaviSite, a Gold Certified Partner, was originally a hosting and co-location company, says Doug Mow, vice president of marketing. Although it still offers those functions, along with managed services, it moved into SaaS when it saw an opportunity. "We have an initiative with Microsoft to develop an ISV sandbox. It's a rack in our data center with Microsoft technologies in a virtual slice of server capacity," Mow explains. The several-months-old sandbox contains a messaging component and database component. Mow says NaviSite is complementing Microsoft's offerings to the SaaS community. "We're filling in the blanks with very, very specific components in areas for which they're not able to provide direct support," Mow continues. These include messaging and provisioning components. Partnering with Microsoft has worked out well for NaviSite, which has SaaS-enabled about 70 clients so far. Greens are brand-new companies that build in SaaS capabilities from the beginning. Blues are large companies that may have a particular pain point, such as ultiple distribution nodes. Rowell estimates that slightly less than half of OpSource's clients are greens, about half are yellows and the remaining few are blues. He warns all companies, regardless of size, that the changeover to SaaS can be "extremely painful." But the pain won't last forever, Rowell adds, "Companies that jump with both feet into the marketplace and deliver full functionality have found success." That advice is seconded by Mike McDonald, CEO of Visual Mining Inc., a Rockville, Md.-based Registered Member. His 10-year-old ISV provides data visualization to convert data into actionable intelligence through a dashboard program. "You have to make a real commitment to it. It's far too easy to want to go back to the cash cows" of perpetual licensing, he says. Although Visual Mining still sells software packages that way, they're adding SaaS capabilities and not looking back. "What got us into the SaaS model was our experience with CRM software that caused problems with consultants, [high] costs, maintenance," and more, McDonald says. Visual Mining is just the kind of company Microsoft is heavily targeting with its SaaS offerings: small and midsize businesses. Those offerings fall under the umbrella of the new catchall phrase "Live." "We'd like to see all our partners on Live," Huwe says. One big advantage for those smaller clients is data, Huwe adds: "You'd be amazed at how many [small and midsize companies] don't have the best lists." Of course, you don't have to bring in partners to switch to SaaS. Qdabra Software, for instance, chose the mostly go-it-alone method. Qdabra, a Registered Member, started about three years ago as a solution provider for Microsoft technologies, explains Shiraz Cupala, Qdabra's general manager and marketing director. Through its work Qdabra started to see a pattern emerge. "Lots of small businesses wanted access to databases without any infrastructure or knowledge," Cupala says. "We realized there was a market for folks who needed solutions but without the infrastructure." That meant building out Qdabra's own infrastructure to handle a different business model; initially, though, that model wasn't SaaS. "First, we were building an internal application, but soon we decided the service model was the way to go," Cupala says. Being a bootstrap company, Kirkland, Wash.-based Qdabra built out its infrastructure and software packages with no outside investment, instead using its consulting business to fund the changeover. Qdabra's first SaaS offering, expected to be in public beta in December, is a project planning and traffic tracking application for small businesses. Qdabra didn't seek assistance from Microsoft, OpSource, Salesforce.com or other vendors, but that doesn't mean it didn't have any help. "We have the tech people we need for the baseline, but we had to hire experts in large scale, distributed SaaS-type environments," Cupala says. Qdabra, a 100 percent Microsoft shop, sees gradual growth as a key to cash flow. "The architecture is one where we start small, maybe five or six servers, and as customers and data grow, we add more bricks," Cupala says. Working with smaller companies such as Qdabra, which has fewer than 40 employees, is a key part of Microsoft's strategy. Huwe says the company is finding creative ways to work with clients to save on expenses such as advertising. "There's been a huge shift in the advertising business. About $18 billion today is spent on online advertising. Today, if you're a large company, you can take advantage of [that]. But if you're a smaller company, it's harder. We're trying to make online advertising accessible to smaller companies by offering partners credit toward online [ads]." Huwe says the advertising credit program will soon be a pilot effort in the United States. OpSource is taking much the same approach. For the "green" companies that are still in the startup phase, OpSource offers an online SaaS Resource Center. The center, Rowell says, contains information for ISVs-for example, on how to structure an application for SaaS delivery, along with sales and marketing help. In addition, Rowell says, "a green company needs to know how to get a product to market, and deliver it, with the lowest amount of capital. A company can come on to our incubation platform and use resources for six months at no charge. We're fully into building the SaaS ecosystem." Ariba's Collison cautions those about to join the ecosystem, however, to keep their eyes on the ball. "The transition to SaaS is much more [involved] than you think, so you have to think about every aspect of your business very deeply," he says. "And don't get confused about your objective: it's not about delivering a URL and password. Quick time to success is the focal point, not quick time to go live." From Microsoft The place to start with Microsoft is its Dynamics Live home page. Dynamics Live is its most advanced SaaS program. ISVs, especially, will want to head to the SaaS section of MSDN, which is truly multimedia, with print articles, video and podcasts. Microsoft also has a CRM Virtual Labs demonstration site for CRM. Microsoft architect Gianpaolo Carraro covers Microsoft's SaaS efforts, and those of the industry, very thoroughly. Keychain Logic founder Ken Boasso does a lot of SaaS blogging on his "Boasso on Business" site. Keychain is a large SaaS provider. SaaS visionary Axel Schultze is currently CEO of Tanooma Corporation and previously held the posts of CEO at BlueRoads Corp. and CEO at Infinigate AG. Other Resources The Software Developers' Forum has a SaaS special interest group (SIG) that meets regularly in Silicon Valley; it's a good opportunity to network with other SaaS players. The Software and Information Industry Association, a trade association for the software and digital content industry, has a valuable SaaS resource section.